A glass rimmed with salt is the carrier for a margarita -- a sweet and creamy beverage made from tequila, sour mix, triple sec, lime juice and sugar. Though the drink seems light and refreshing, its taste is deceptive. Frozen margaritas -- blended with crushed ice or served "on the rocks" and poured over ice cubes -- are laden with calories. What constitutes a jumbo frozen margarita will vary from restaurant to restaurant. 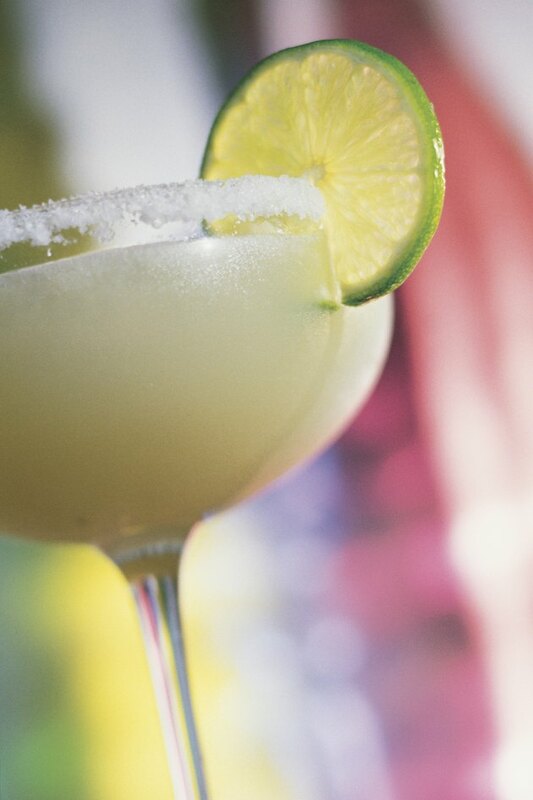 Livestrong's MyPlate estimates that a hefty 16-ounce frozen margarita has 300 calories. A 6-ounce margarita on the rocks has 168 calories, so 16 ounces would pack a whopping 448 calories. A frozen margarita may have more or fewer calories depending on size and added flavorings and ingredients. You can make yourself a lighter margarita at home by replacing sugar with stevia or sucralose. Squeeze ripe limes for a bright, fresh flavor and use just an ounce of tequila. Pour the drink over ice or blend it with crushed ice cubes. A skinny margarita will only cost you around 150 calories. How Many Calories Are in a Margarita on the Rocks?